The Siva (Italian Society Vendite Automoblie) was a small automobile manufacturer based on Lecce in 1967, which operated until the early months of 1969. At the Turin Motor Show 1966, Achille Candido, from a family of entrepreneurs Puglia and owner of a Ford car dealership in Lecce, presented with a folder of sketches in which the car came out that he had in mind to build: a sport with two bucket seats, rear engine and a low center of gravity. His intention was to subject them to Domenico Iseglio, former designer of Bizzarrini and Bertone, founder a few months and holder of "Italian Style". The idea of building a light and fun car, for a young, enthusiastic Iseglio, which began to the work; Candido had clear ideas when he instructed the engineer. Moretti (ex Abarth) for the design of the chassis and Conrero Virginio for the preparation of the engine, began to weave the "canvas " to complete the enterprise. Propose to the Ford car to market the product in the network of trademark and began negotiations with the bank. Ford agreed to willingly, eager to cover the shortage of its range in the field of sports cars aimed at young audiences, and decided to supply the engines fitted to the Ford Taunus 20M. The engine was a longitudinally mounted 2-liter Ford V6 unit, tuned by Conrero. A top speed of 200km/h with a weight of less than 900kg was promised. Achieving the necessary agreements with the banks, Siva was founded (Italian Society Vendite Automoblie), with the program to build 300 cars in 1969 and another 500 in the 1970. 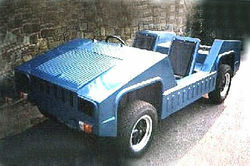 Shortly before the summer began construction of the prototype with a modern chassis box, topped with a light Targa like aluminum body. The 2000cc, six-cylinder, 85 HP Ford engine, after Conrero "tweeked" it, develop 145 hp and was perfect for a car that is hardly to 850 kilograms. The work became hectic to build the prototypes for the Turin exhibition of 1967, where he was presented a static model for the exhibition and another for the ritual tests at the Valentino Circuit and reserved for the press. The car, named "Sirius" (the name of Star brighter), received a great success by both the public and operators, supported by a number of reservations. The early months of 1968 spent refinement of new prototypes and the identification of the site where to put in place the structure of production for small series. Unfortunately, the sudden and unexplained withdrawal from the "group" of banks, blocked any hope on the rise of production. The Siva closed its doors in early 1969.